After months of construction, Marysville Public Schools is unveiling one of the first and most visible phases of their facilities bond projects -- a new synthetic turf athletic field and 8-court tennis complex. Both are part of the overall district facility upgrades approved in the May 2007 by district residents. 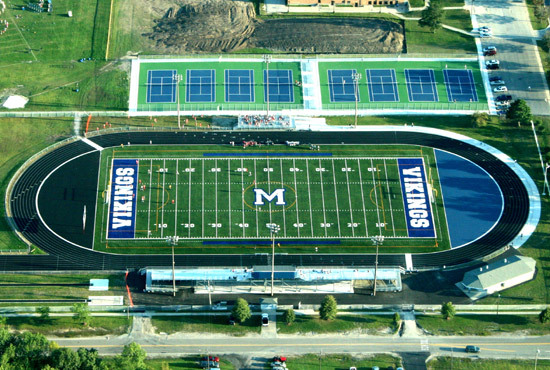 The multi-use athletic field will host Marysville's football and soccer teams as well as the Viking Regiment marching band. Now district teams will be able to utilize the districts premier field without worry of damaging the once-fragile grass turf -- no matter what type of weather condition they're experiencing. District officials estimate the field will see triple the use it's seen in years past -- and year round. Once considered an extravagance, synthetic turf fields practically pay for themselves these days. Based on Marysville's past maintenance practices and tangible costs (mowing equipment, gasoline, seed, soil and labor), turf field industry experts predict there should be a direct return on investment (ROI) within 10-12 years. The once-concrete stadium seating has been replaced by a 1200+ seat aluminum alloy construction bleacher unit, complete with a 200 sq. ft press box atop. The 62-year old concrete stadium was thoroughly tested for structural stability and found to be unsafe by an engineering firm hired by Marysville Public Schools in late 2007. Over several decades of use, cracks in the concrete structure formed. That, and subsequent water damage, caused the concrete to crumble and weaken, resulting in a concrete density rating that was roughly at 50% of acceptable State and Federal standards for public safety. Additional athletic field projects will begin construction late in 2009, with newly constructed Varsity and JV girls software fields wrapping up over the summer in 2010. Many thought it was not possible, but yesterday Marysville voters approved a $74 million bond project to upgrade, renovate and improve existing buildings, while also approving the construction of a brand new high school. Remarkably, the bond initiative passed by the small margin of 55 votes. Marysville's Board of Education, along with school administrators and a large committee of city residents, balloted a bond project that will change the face of Marysville Public Schools for decades to come. In addition to the building improvements and new high school, a new artificial turf athletic field, tennis courts and baseball diamonds will be constructed. Though many of the details are yet to be released, construction should begin April 2008. The tennis courts and athletic field projects should wrap up in early July 2008, just in time for student-athletes returning for the fall sports season. High School construction will begin later that year. Spring isn't far off and the School District's thoughts are turning again toward addressing district facilities. Marysville's Board of Education will meet in March to discuss the state of their current facilities to determine whether a bond issue will be needed to address the aging school buildings within the district. Topics expected to be discussed will cover likely repairs and improvements to nearly every district building, including the high school. Marysville's school buildings are, on the average, the oldest in St. Clair County, as some buildings are approaching or beyond 60 years in age. Specifically, parts of the current high school are nearly 70 years old and are beginning to show their age, inside as well as outside, despite being well cared for over the years by Rick DeNardin, Marysville's Facilities Maintenance Director, and his staff. Though building a new high school isn't out of the question, school officials aren't necessarily pursuing such an expensive project, especially in lieu of current statewide education funding limitations and lack of compelling enrollment growth projections for the district. Not that building a new high school out of the question. All options are on the table for discussion. In 2003, a bond issue campaign that proposed $19.2 Million in building renovations and improvements failed at a nearly 2-1 margin due in part to poor voter turnout and general lack of support by parents of school age children within the district. School administrators are hoping for better parental and community-wide support, despite the State's increasingly gloomy economic climate and its effect on residents of St. Clair County as a whole. Soon enough there'll be "skating" in Marysville all year round -- this time Extreme Skating. Marysville's Recreation Department is planning to begin building a skate park for kids young (and old) in Spring 2007 along Busha Highway in Marysville. This skateboard and rollerblade park will host multiple ramps, 'tubes' and railing assemblies. There will even be a 'wing' that will service novice skateboarders. According to city recreation officials, the final price tag for the skate park will likely be between $140,000 and $160,000 (including the purchase of the property adjacent to the current municipal park on the premises), according to city recreation officials. Funding for the park will come from the city recreation budget, county recreation sources, as well as other outside funding sources & grants. Though the skate park was originally planned for a summer 2006 construction, lack of grant money has delayed the project nearly 2 years. The proposed park will now open June 2008. Though Marysville Schools have seen a small decline recently in overall enrollment, they remain a popular 'School of Choice" option for students from Port Huron and East China areas. Still, there is an overwhelming need for renovations to the district's aging buildings - especially the high school which hasn't seen any development in nearly 30 years, and parts of which are approaching 70 years in age. Not that Marysville school administrators haven't sought to address the issue. Marysville's school board unsuccessfully campaigned for a $19-million dollar bond issue in September 2003 to add classrooms, gymnasiums at both the Jr. and Sr. high, add additional parking space, replace older roofs and to make internal renovations (some of which are safety-related) in every school building. Unfortunately, according to polling records, less than 12 percent (roughly 1 out of every 8) of the district's parents of school-age children voted in the bond election, resulting in a crushing 2-to-1 defeat of the board's proposal at the polls. Later polling conducted by the St. Clair County RESA revealed that Marysville's voters are unsure of the direction in which they'd like to see the district go. This comes as bad news to a district badly in need of extra space for its athletic programs and with up-and-coming challenges as a result of recent court decisions relating to Title IX. Title IX refers to the part of the Federal Education Act of 1972 that mandates that all institutions that receive Federal aid must provide equal athletic opportunities for women and men. A recent Title IX ruling in Michigan will require all public schools to reorganize their girls (and boys) athletic programs and their respective seasons. In 2001, a lawsuit filed by two female athletes claimed that the Michigan High School Athletic Association was not in compliance with the Title IX statute, as their women's programs' seasons didn't mirror that of their NCAA collegiate counterparts, thus creating a mis-match that was discriminatory and limited their exposure to prospective college coaches and scouts. A Michigan court agreed, and after numerous challenges and nearly three years of appeals, that decision will stand. Compliance with Title IX will prove to be quite a challenge for smaller districts such as Marysville Public Schools, whose athletic facilities are generally either too small, outdated or already stretched to their usage limits. Competition for limited gym space this fall will force student athletes to practice before school (at 6:00 or 6:30 AM for example) or face the prospect of practices that will go on well after 10 PM at night. Limited gym space may also cause difficulties for scheduling athletic contests, even potentially limiting the number of home games that can be held in some districts. Both scenarios are causing school officials and parents much concern as Fall 2005 approaches. Marysville's administrators estimate they'll need at least two additional competition-size gymnasiums in order to accommodate both girls and boys basketball teams at all levels. This is in addition to other sports teams or organizations that compete for access to the gymnasiums during the fall and winter seasons. Marysville school administrators and acting high school Athletic Director, Terry Curley, are already discussing possible ways to address this facility scheduling problem. Without additional facilities, and ones that can accommodate even a conservative number of spectators, this is a problem that won't soon go away. School officials are hoping for a grass-roots movement in the city and townships to build a community-wide support network that will push for an already-badly needed building program. Without community input and action, Marysville students and their families can expect to be inconvenienced for a number of seasons to come. That means nearly everyone in the community with school age kids involved in athletics, band and other extra curricular clubs/activities will be inconvenienced to some degree. Luckily for Michigan high schools, the proposed TItle IX changes have been delayed pending further review by the Michigan Supreme Court. A ruling is expected as early as Fall 2006. After six weeks of consideration, numerous interviews, school board site visits and general deliberation, Marysville's Board of education voted unanimously, 7-0, to hire John G. Silveri of the Allen Park Schools as the next Superintendent of Marysville Public Schools. Silveri, originally from Trenton, Michigan, was most recently Assistant Superintendent in Allen Park Schools, a district he has served as teacher, counselor and building administrator for over 25 years. He holds degrees from Central Michigan University, Eastern Michigan University and Wayne State University in Detroit. His two grown children, a son and a daughter, who are graduates of Allen Park Schools. His wife, Lois, works as a Nursing Administrator in the Metro Detroit Area. The other finalist, Ms. Sandra Standel, is Assistant Superintendent with the Royal Oak Public Schools. Ms. Standel is a former 17-year Marysville Public School employee and resides in Fort Gratiot Twp. Details of Mr. Silveri's contract have not yet been made public, but a school spokesperson indicated that Silveri's negotiated contract is expected to be competitive with that of other area superintendents of similar district size. Mr. Silveri is expected to begin work April 11th. A season of change is in the air in Marysville. The Marysville school district is currently interviewing candidates for School Superintendent to fill the vacancy left by Charles S. Andrews, who retired in January 2005 to take an administrative position with the St. Clair County RESA (formerly known as the St. Clair County ISD). Potential candidates were interviewed by the School Board February 3rd, 4th and 5th at the Marysville Municipal Building's city council chambers. The final two candidates being considered are Ms. Sandra Standel and Mr. John Silveri. Ms. Standel is a former 17-year Marysville Public School employee, while Mr. Silveri is currently assistant Superintendent at Allen Park (MI) Schools. Both are experienced administrators with extensive management and labor negotiating experience and considered strong candidates for the job. A final candidate selection is expected to be completed by the end of February 2005. The successful candidate will likely begin work sometime April 2005.